TOKYO, JAPAN: Japan’s sewerage industry has found a way to clean up its dirty and smelly image: elaborately designed and colourful manhole covers with 12,000 local varieties nationwide — including, of course, a Hello Kitty design. The designs represent an instant guide to a place as they feature its history, folklore, or speciality goods: a castle design for an ancient town, a bay bridge for a port and Mt Fuji for a city at the foot of Japan’s iconic mountain. As for Tama City, located in the western sprawl of greater Tokyo, locals are pinning their hopes on a more modern Japanese icon — Hello Kitty — to attract tourists, alongside the town’s theme park showcasing much-loved children’s character from the Sanrio company. 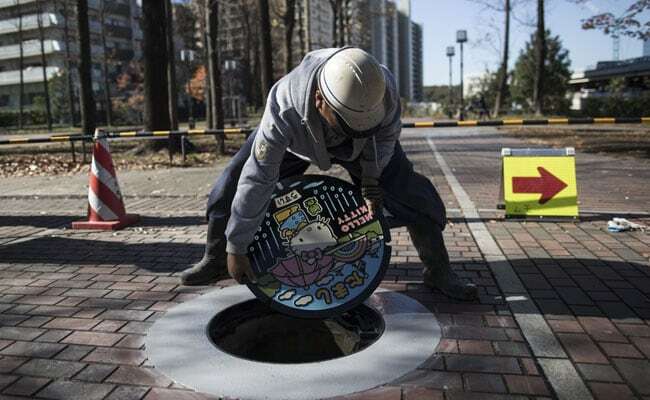 “We’d be happy if people come and take some time for a stroll in our town while looking for the Hello Kitty manholes,” said Mikio Narashima, who heads the city’s sewage system division, after the city installed the first of the 10 designed covers. Veteran spotter Shoji Morimoto said his passion for covers was fuelled after noticing that the central city of Fukui sported two phoenixes on its manholes. He later learned the imaginary birds were a symbol of the town’s rise from a 1945 devastating US air raid and a deadly earthquake three years later. “I sometimes do research on why the town has that particular design. I’m impressed whenever I find out it represents the town’s history and culture,” said Morimoto, who coined the word “manholer” for like-minded people. Designed manholes cost more but appeal to a Japanese sense of detail, the 48-year-old Morimoto told AFP. He has already visited all the designed manholes in his local area. “Now I have to travel far,” he admits. “Manholers” take pictures of the covers they visit, with the more obsessive taking rubbings. For others, the interest lies more in “cover bonsai”, plants growing on soil accumulated on and around covers. More than 3,000 people attended a “manhole summit” in western Japan in November. And manhole covers are not simply there to hide away dirty sewers, enthuses Tetsuro Sasabe, who is interested in covers for telecoms infrastructure. “I’m interested in why the manhole is there, where it leads to — I’d say I’m interested in what’s under the manhole covers,” he said. He noted that there is a story even to plain covers — such as finding the logos of now-defunct companies. Given their size, the covers cannot easily be collected in the same way people hoard stamps and coins. But to satisfy collectors’ desire, the private-public GKP network designed to promote awareness on the importance of sewerage in society, has released 1.4 million cards of 293 different covers. The cards are free but they can only be obtained through local offices, thus working as a tourist magnet. They are numbered in chronological order and come with the manhole’s exact GPS information for the convenience of manholers. “We believe Japanese manholes are cultural products we can boast to the world,” said Hideto Yamada, a GKP planning official. And when a real cover does become available, demand is brisk. The eastern city of Maebashi held a highly competitive lottery in October as its offer to sell 10 used manhole covers — 40 kilogrammes of iron — at 3,000 yen ($28) each was swamped with more than 190 bids. The history of decorating manhole covers in Japan dates back 40 years to a bid to improve the image of the sewerage system, according to GKP’s Yamada. Cover designs must have the same friction level no matter which direction humans or cars come from so that people do not slip over them. This need for friction resulted in placing extra streaks of clouds, sea waves or tiny stars in the background, giving birth to “condensed designs,” Yamada said. Overall, there are some 15 million manholes in Japan, of which only a fraction have colourful designed covers, carefully hand-painted. A plain cover costs some $600 but a colourful, designed one can be double that depending on the number of colours used and the level of detail used. The craze has since spread online with abundant information on where to find the best manholes via the hashtag #manhotalk. Can Food And VR Combine To Create Art?